Every year, around this time, the dreaded term ‘taxes’ is brought back into some of your daily conversations. Tax time, as viewed by most, can’t be over soon enough. However, learning how to maximize your deductions and increase your return is something every real estate professional should know how to do. 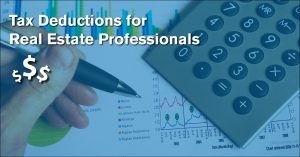 Every real estate professional has a variety of expenses for their business throughout the year and being able to accurately identify and track your expenses to be used as deductions is critical to maximizing your return. Even if you hire a professional to handle your taxes, knowing which expenses can be written off is useful information for any professional. Be sure to track the following expenses throughout the year to receive the benefits come tax season! Have a home office? Perfect! You’re eligible for a home office deduction. If you’re a member of a brokerage that charges a desk fee to use their office be sure to track and itemize this expense. If this is the case, then please note that you will not be able to claim the home office deduction since you have claimed that you work from the Brokerage’s office. Office related expenses of any kind can be written off. These include items such as: paper, copies, desk supplies and any item or consumable that you needed to run your business. Larger purchases such as office furniture, machinery, electronics, etc can expensed in full. For things used, such as your cell phone, you can deduct the percentage used for your business. If you’re in real estate, you know that to have access to the required tools and software you are going to have various membership fees due throughout the year. Your state license, your membership to the local MLS and any secondary ones, any designations you have and any other membership fees are all deductible from your taxes. Regarding any professional memberships you may have: the portion of your dues attributable to lobbying and political advocacy is not deductible. Your general business insurance and error & omissions insurance are both fully deductible expenses to keep in mind come tax season. Working in an industry like real estate relies on you never growing stagnate. Your competing against all of the other agents in your market and staying on top of your game is a must if you wish to continue producing. You may pursue your development with things such as trade shows, continuing education, conferences, coaches & other helpful material and the travel and accommodation costs for these trips, granted they are for business, are tax deductible. It’s 2018, and as an agent you are probably utilizing a CRM platform or software suite. Any software needed to run your business, that you pay for, can be deducted come tax season. If you are a part of a brokerage who offers these suites at no expense to you then you will not be able to claim this deduction. Like any business, yours must market to find new clientele. Any successful agent invests in finding new business for themselves through marketing and promotion. Any production costs that go into producing these materials for you and your business can be deducted from your taxes. This includes website design and hosting fees, SEM, PPC advertising, video production and other forms of media are all tax deductible. Aside from your cell phone, a real estate agent’s best friend is their vehicle. You spend a lot of time visiting properties with clients, showing potential ones around, and placing and gathering signs in your car. There’s a relatively easy way to break down mileage for tax purposes. If you drive 10,000+ miles per year you are better off taking the standard mileage deduction from which you will receive the greatest benefit. If you’ve been keeping track and you’re below that then actually itemizing your costs can get you the greatest bang for your buck. If you are someone who drives a lot then using an app on your phone to track mileage can be very helpful! If you’re an agent who takes advantage of real estate commission advances to grow your business then it’s nice to know that any fees that you pay associated with advance are tax deductible. Now you can get the funding you need before closing and then turn around and write the fees for that advance off on your taxes. Get started with a real estate commission from Zen Commissions by applying today! Be sure to keep these expenses in mind and track them as you operate your business throughout the year. Making your refund go the extra distance can mean a lot for a budding business like yours. Consult with a tax professional for more information.